If your local feature branch tracks origin/feature, you are probably working extra, no matter your flow. There are lots of places online where one can learn about GitFlow, but it's seemingly always discussed in a local way; the details, subtle or not, about using GitFlow when you are pushing and pulling your changes through the network are never mentioned. Now, GitFlow is a bit long on the teeth, and some of the younger and simpler alternatives do take into consideration things as Pull (or Merge) Requests; lately some even want the original GitFlow to be considered harmful. But still, there's a common basic concept in GitFlow and the alternatives, which is local feature branches. How and when exactly to merge them back into a development branch is one of the big differences, but is rarely detailed. The goal of this post is to gather some tips on how to keep developing in the local feature branch while staying involved on a lively repository; and how to make easier the final feature merging. The problem is that using GitFlow as if it was all-local and then simply adding remotes to it makes things cumbersome. It's one of those cases were we start accumulating long recipes of maybe-redundant-but-hopefully-safe steps, yet we aren't confident enough about it to just make a script. Result: busywork. And busywork that should be repeated frequently is a recipe for problems. And one place where you don't want problems is your source tracker, do you? So. In this context, there's a simple git trick that I haven't seen mentioned anywhere: a local branch can be tracking a remote branch with a different name, and git will deal with it in a meaningful way. It will keep rebasing your local branch against the remote branch , and if you try to push, git will complain that the branch has a non-matching name (so you can't end up pushing somewhere unintended unless you are really explicit). This is pretty much perfect for a multi-developer feature-branching workflow (like GitFlow or one of its simplifications, like Atlassian's "Simple Git workflow" or "Feature Branch workflow"). Let's see what it changes from the "local-only" GitFlow. All the instructions I have ever seen for GitFlow start by creating a feature branch from the branch develop, working and committing on it, and eventually merging the feature branch into develop. Just merge (with no-fast-forward): what was advocated by GitFlow. The feature branch's track of commits stays parallel to the develop branch, to which it merges. This parallel track happens always, even if the develop branch didn't advance while the feature branch was developed. But there can be commits in the develop branch, inside the bump! Just merge (allowing fast-forward): some people don't like the bumps of short-lived feature branches on an otherwise idle develop branch, as shown at left; in that case, instead of the bump, they prefer the commits of the feature branches just going into the develop branch when a fast-forward merge is possible, so no branching remains in those merges; just as shown at right. Rebase-and-merge: the goal here is to create the bumps that the fast-forwarders dislike. Develop always stays unchanged inside the bump, just as shown at left. For this, one has to explicitly rebase on top of the develop branch just before merging. OK, so at this point we know what we want. The problem is implementing it, as in being able to deal with the branches multiple times daily without getting bogged down. If possible, we want to do things so simple that they won't require changing mental tracks nor elicit the typical reflex of "oh no, not now, I'm too deep into [whatever else] right now". # no need to checkout develop, just stay on your feature branch! It's important to note what is missing: since you don't have a local develop branch head, you don't have to manage it: no need to checkout in and out of it, and no need to rebase it. After all, it's logical; you are not going to change the develop branch locally, so why even create it? And at this point, we have an one-liner that can be used without second thoughts. In fact, now we can even use our GitFlow(-like) workflow together with a tool like Android's repo: you can do "repo sync" whenever you want and repo will do the fetch+rebase for you in your current branch, in all the repositories you configured. Since we are here, let's see what other options are there. We have optimized the everyday task of rebasing our local feature branch on develop. But, the best optimization you can do to anything is... to remove that thing. And maybe we can do this here, too: we are wanting to do 1 fetch + N rebases (with N = the number of local feature branches), maybe multiple times a day, all to make an integration test: making sure that our changes keep working well on top of the last commits of the remote branch origin/develop. Is there another way? Yes, there is. 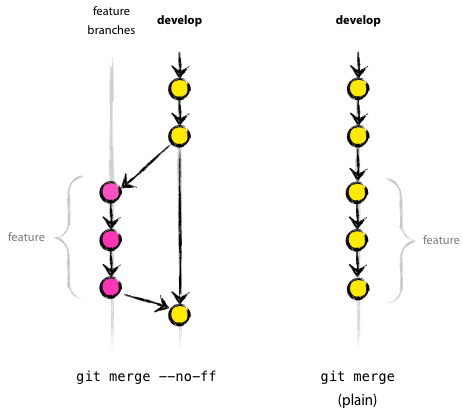 The way used in git's own development process, as explained in "man gitworkflows", is: instead of rebasing, make a "throw-away" integration merge where you merge everything at once (develop+feature branches) and do whatever integration test you want. Once you're satisfied, you get rid of the merge and continue developing the branches. # stay on your feature branch! $ git merge origin/develop feature_bar feature_foo # all your branches! Note that there can be merge conflicts, which is an advance of what will happen when you finally merge the features to develop in the future. And the conflict resolution you do on the throw-away merge will be, well, thrown away! Fortunately, you can enable git rerere, with which git will record the resolution of conflicts and reapply them automatically in the future. OK now, so just merging the branches in place is conceptually even simpler than rebasing those branches... in a way. Though, to me, having to do and then "undo" a merge still sounds too involved for something that I might want to do multiple times a day. Let's daydream. Couldn't we just merge everything whenever we want, and keep the results, in such a way that later we will still be able to rebase easily, once each feature is complete? Yes, we can! But as before, you must make your local feature branch track origin/develop. In summary, what we are doing in this case is a more extreme/lazier version of the throw-away merges: we don't throw them away at the moment, but keep developing. When we finally rebase, the merges are implicitly unlinked and thrown away (so once more, git rerere will be useful in this case); we just don't care about them in the meantime. Once more we get rid of the busywork. At the end of the day, the interesting thing here is that a lot of ceremony (even for the original, "almost-local" GitFlow!) 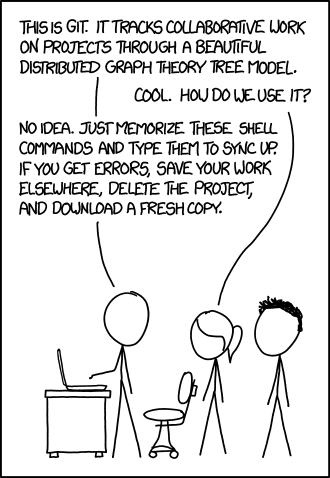 can be avoided by just correctly configuring git for our use case. Which I'm afraid is long form to "I should have RTFM". On the other hand, I'd say I did read it. And looking around, one sees that git questions in Stack Overflow can get >10k upvotes and >3M views; which is an order of magnitude more than, say, C questions, even though these are about 4 times more abundant. I guess it does imply something bad about git's documentation and/or complexity. There are possible reasons to do so: like filing a Merge Request and being told that you still need to change something. The problem is that, while you finish and push some new commit to that branch, develop might get some new commits too. And now you have a problem: to fully follow the rebase-and-merge philosophy, you should now rebase your already-published branch, and push it again; but that is a big no-no in the "standard" git world. In practice you can just use git push --force, but that needs some caveats, as explained elsewhere. Maybe also in another blog post?